You can connect your Facebook Page to Recart in under a minute so you can get started with Messenger Marketing right now. Recart will send all Facebook Messages using your the Facebook Page of your store. For that reason, your Facebook Page must be connected to Recart to start using Recart Messenger features. Usually, it's very simple to connect the desired Facebook Page to Recart. All you need to do is click Connect, approve the requested permissions and select the desired Facebook Page from the list. In case you get an error message or do not see any Facebook Pages in the list, there are a few things you should check to resolve the issue. First of all, please verify that you are an administrator for the selected Facebook Page. If you do not have administrator privileges for the desired Facebook Page, please contact the administrator and request that you are added as an administrator. Alternatively, any administrator can log in to your Recart Dashboard and connect the Facebook Page. After the page is connected, you will be able to use Recart Messenger features without any issues. Please also verify that you approved all the requested permissions that Recart requests when you first connect a Facebook Page to Recart. After accepting the requested permissions, you will be shown the list of all the Facebook Pages Recart can access. Here, you can select the specific Facebook Page you would like to use with Recart. We recommend approving all requested permissions to avoid any future issues. Recart will never post to your wall or share any posts from your account. 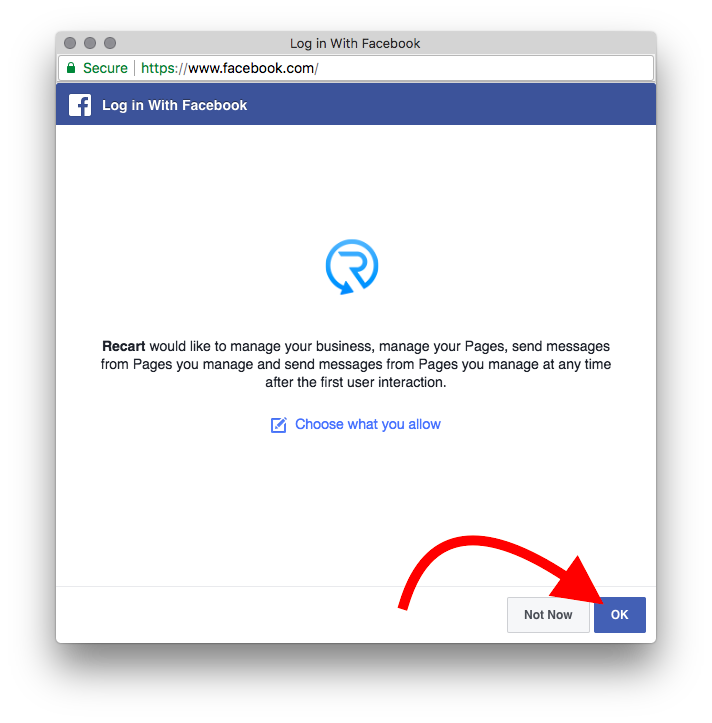 Recart will only use the approved permissions to add new Facebook Messenger subscribers to your Recart account and send Facebook Messages to your visitors and customers from the selected Facebook Page. In some rare cases, there might be some tricky issues with connecting your Facebook Page to Recart. Don't worry, our team will be happy to help you out! Please click on the chat bubble in the bottom-right corner to let us know if you have any questions or need any help!